Sporting activity – walking, running, jumping – places greater physical demands on the body than normal day-to-day activities. 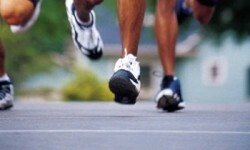 While running, your feet can absorb up to 3 times your body weight. Not surprisingly, injuries to the foot and lower limb make up a large proportion of sporting injuries. Podiatrists understand the structure and movement of the foot; therefore, they can diagnose foot conditions, recommend appropriate footwear, and training regimes.